Cuddling in the valley of Kashmir Gulmarg is on the south west of Srinagar. 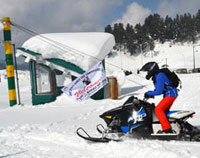 Gulmarg height is at an altitude of 2730 metres above the sea level. 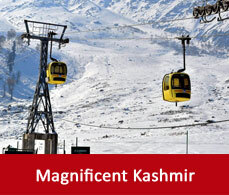 The meaning of the name of Gulmarg inherits its beauty. 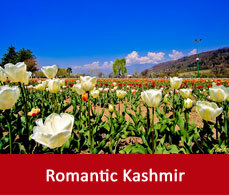 Gulmarg means the path of flowers. It is a gently sloping land covered with velvety green grassland blooming with wild flowers. History reveals to us the fact that it was the favourite tourist spot of emperor Jahangir and he collected 21 number of variety of flowers from there. 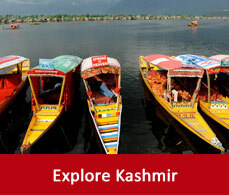 It is also the hot spot of the Bollywood film industry as a shooting destination. The backdrop of Gulmarg with the snow topped mountains and the fascinating surroundings makes Gulmarg hill station such a place which people hanker to explore in India. During the winter it gets draped up in snow and is an ideal place for snow adventures. For expeditors it is an ideal place for trekking as mostly it is used as a base for trekking to the Himalayas. Reaching Gulmarg through the three roads with the paddy fields lining the paths and the small villages makes it a beauty to gaze by. 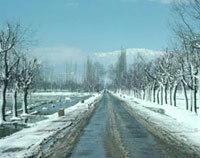 With the change of season the roads of Gulmarg,Kashmir also changes its colours in the season’s hues. While travelling at a certain point travellers stop their car at View point to catch the beauty of that place.